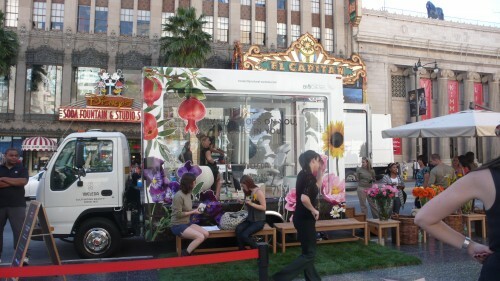 I recently interviewed actress, environmentalist, and businesswoman Soleil Moon Frye at the Weleda “Honestly Natural, Truly Beautiful” national mobile tour when the Weleda biodiesel truck stopped in Hollywood at the bottom of the Hollywood and Highland shopping mall. Weleda sponsored the tour in support of the Campaign for Safe Cosmetics to promote safe and natural ingredients in lotions, cosmetics and shampoos. Weleda uses 100 percent plant based botanical ingredients in their products with no animal testing. The biodiesel truck provided opportunities for everyone to receive a mini-spa treatment, take home samples of great Weleda products, and film a short video for a chance to win a trip to the Weleda Spa in New York. Also on hand was Soleil Moon Frye. Frye played the spunky orphan in the 1980s TV series Punky Brewster and as an adult was in Sabrina, The Teenage Witch. She has directed several films and currently is the voice for Aseefa in Nickolodean’s animated Planet Sheen. Frye also owns The Little Seed, an environmentally conscious children’s specialty boutique in LA. I sat down with the busy actress to talk about her connection with Weleda, her eco-friendly LA store, life as a mom, and her upcoming projects.